1. Make sure the RTX 4002 repeater is not powered on, the N300/N510 should be powered on and have at least one handset registered. The setup should be done near the base unit, the repeater can be moved once registered. 2. On a registered handset go to Menu > Settings > ECO DECT, Maximum range should be ticked, no radiation should be unticked. 3. In Menu > Settings > System, Encryption should be unticked (in older firmware it may be labelled as repeater mode, which should be ticked). 4. At this point its best to also check the system pin is set to "0000" as the repeater will only work with that pin. 5. Power on the repeater, remove the power again after a few seconds. 6. Power on the repeater again it should flash slowly. 7. Put the Gigaset base unit into pairing mode (hold the button on the front until it flashes or go to http://*baseip*/settings_management_miscellaneous.html and start registration). 8. The repeater should start flashing rapidly, if it doesn't do this after 2 minutes repeat from step 4. 9. If this is the first repeater registered to the base dial 2* from the handset and press * as soon as the call connects (they may hear a message saying the call cant be connected, this is normal). If this isn't the first repeater increment the number dialled by one for each unit i.e. 3 for second unit, 4 for third unit etc..
10. The LED on the repeater should go solid, the repeater can now be moved to the desired location. Please Note: When unplugging the repeater please remove the plug from the back of the unit rather than unplugging the socket from the mains. This allows the user to check if their handset is connected to the repeater or the Gigaset base, when enabled it will play a beeping tone on the handset when making/receiving calls. 5. To check if the tone is on, make a call to 156 when the handset is out of range of the Gigaset base but still in range of the repeater. 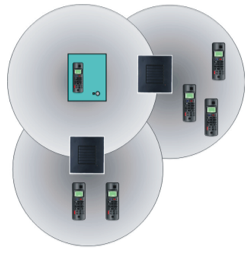 Up to 6 repeaters can be used, however the must all be within range of the Gigaset base unit (they cannot be daisy chained). 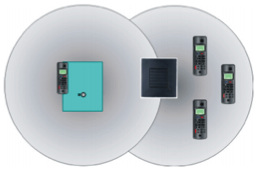 It is best to place the repeaters so they overlap where possible as this will allow the handset to switch from cell to cell without interruptions to calls.